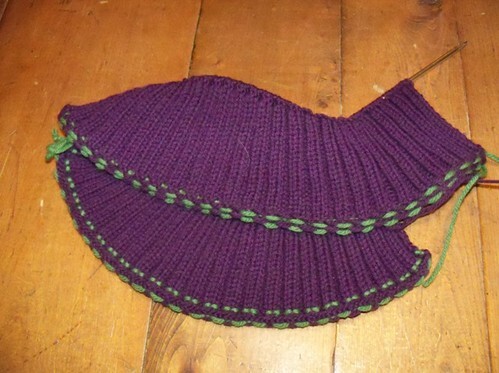 The final sweater is the continuing saga of my green and purple sweater. I’d chosen the colors for this sweater off Quince & Co’s website, and when the yarn arrived it wasn’t quite what I’d expected. This is just to remind me that colors may vary from monitor to real life, right? Well I was pretty sad about that cable swatch, and showed it to a number of knitting friends in real life, who all agreed following my original plan wasn’t going to work out well. 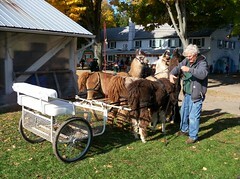 My friend Amy commented, on our way to Rhinebeck, that maybe I’d find inspiration while there. And I did! I saw Mary-Heather (yes, Ravelry’s Mary-Heather) wearing Orange Pop, and I realized this would make a great green and purple sweater. The pattern is designed to use eye-catching colors, but even better, it uses 5 different colors. That’s right, I’m going to solve my green and purple problem by adding MORE green and purple. 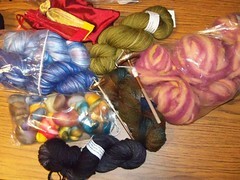 The photo is blurry, but (at least on my monitor) it shows the true colors of the yarns I’ve chosen. Ordering a color card would have been the safe way to go. Instead I sat, looking at the colors on the screen and thinking, “ok, everything is bluer here then it is in real life” and then took my chances. The far left purple and the far right green are the originals – Frank’s plum and Snap Pea. The green and purple in the middle, Orchid and Parsley, are the new ones. Parsley plays well with Snap pea and Frank’s plum. Orchid plays well with Frank’s plum and Snap Pea. Orchid and Parsley play well together, and Frost (the white-ish blue) gets along with everyone! So the other colors will act as buffers between the two originals. While it’ll be a very vivid sweater, I’m hopeful it’ll avoid clashing with itself. I’ve knit the hem (I knit the sleeves while I was waiting for the new green, purple, and white to arrive). The next row involves Frank’s Plum and Orchid. 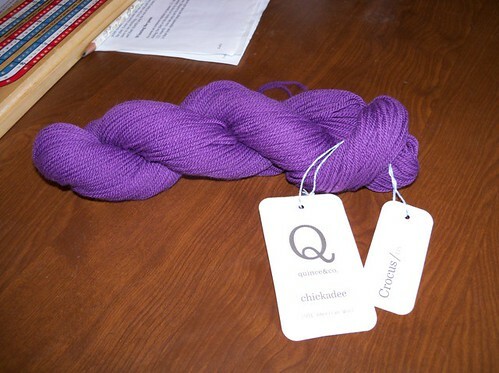 I hope to be knitting it later tonight, assuming my final skein arrives today. I’ve been sending Fast Shipping vibes to the USPS all week. I had enough of an inkling that I might use it as a design to take notes, and keep track of my color work chart. But the sweater didn’t work out just right. You can see there’s puckering in the yoke (and that’s after I blocked it as best I could) and the shaping in the shoulder and collar wasn’t quite right. It bothered Neil and he pulled down on his sleeves a lot trying to make it sit properly. We both liked the idea of this sweater better then the finished object. Two years later I have a much better understanding of the construction of yoked sweaters. 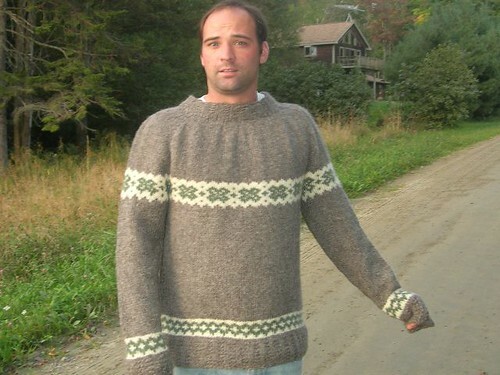 But instead of ripping out the yoke and re-knitting it I decided to re-do the entire sweater. The original was worked in Bartlett wool, but this time I’m using Knitpicks heavy weight city tweed. This yarn is much softer. Neil and I decided to keep the color pattern the same, because that part does work for Neil – and we all know how finicky men can be about their sweaters. 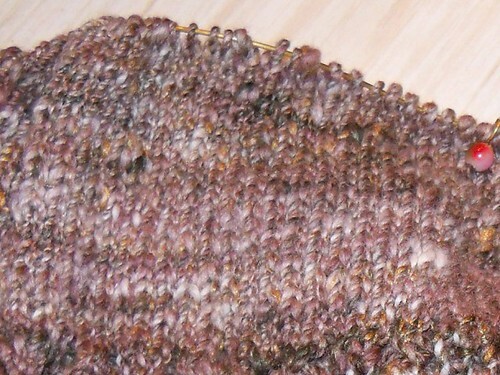 I started with the sleeves for this one because they double so nicely as a gauge swatch. 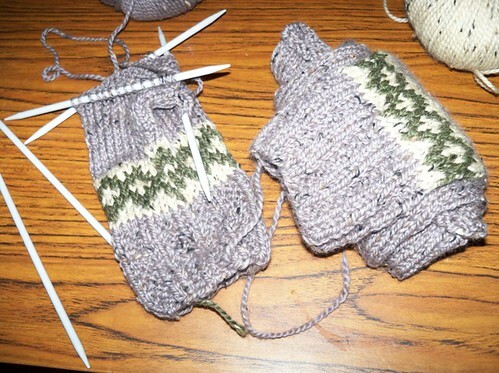 So once I’ve knit both sleeves I’ll work the body second and join to knit the yoke. 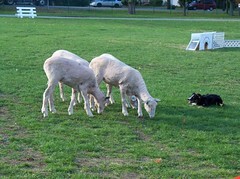 I will need test knitters for this pattern! Probably sometime in late November or December. The sweater is designed for men – it doesn’t have any shaping, but if you like a big, comfy sweater it could be worn by women too. If you might be interested in helping out, let me know! I’m still loving this sweater. It’s knitting up without a hitch (yet (knock on wood)) The handspun yarn is going a long way too! 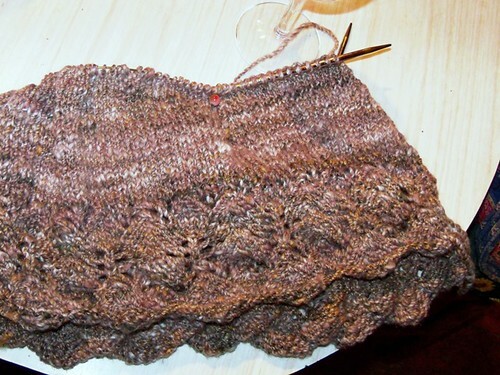 I used just 2 skeins in the lace hem and cuffs, and another 2 skeins so far in the body. I’m working the bust increases now, and I hope that my 5 and 6th skeins will complete the body. Then 7 and 8 will be to finish the sleeves, and I have one last skein of the extra-green batch which I hope to use for that cozy, squishy collar. 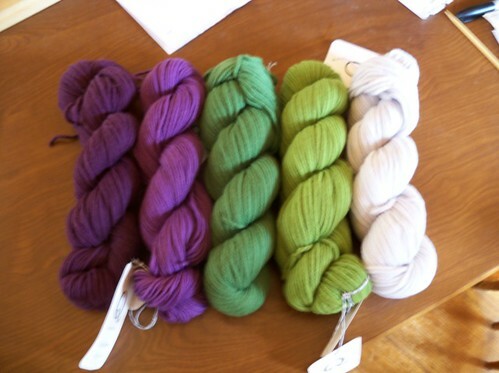 If all goes according to plan I won’t have to use any yarn that’s two plies of the less-green batts. I love the way the handspun yarn looks all knit up in the simple stockinette. 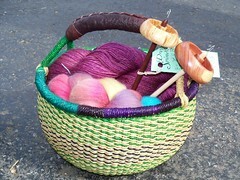 Slightly shiney from the BFL and silk, mottled from the colors all mixed together in the blending and plying. Even though it’s not the most even yarn I’ve ever spun I think the stitches blend so well you really can’t tell how nubbley the yarn is in the final fabric. 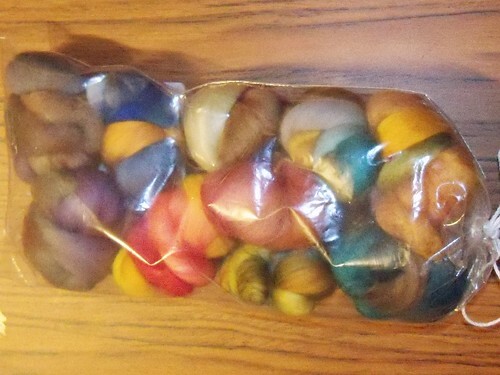 I love the way it smells too, I’ve been washing each skein with soap that has a lovely, woodsy smell to it. The only thing that seems to have gone wrong is the timing. I thought I was going to finish this sweater by the end of October. While I am making good progress on it, all these other sweaters keep popping up and asking to be knit as well! The first sweater has that distinction because I’ve been working on it the longest. “Working on it” loosely meaning it’s been in progress, but it has spent a lot of time in the back of the closet. I swear it has looked just like this, for ages. 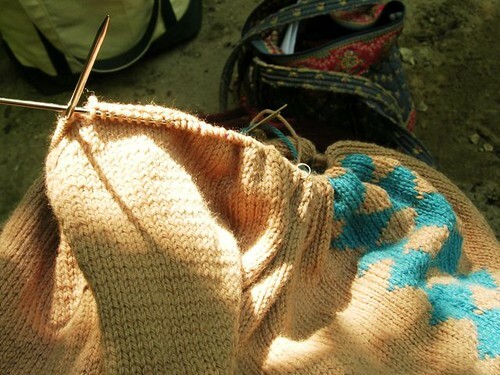 I knit and knit, and it still looks just like this. The pattern is the Argyle Jacket from Twist Collective. Sadly, I’m knitting this just for the finished object. The knitting itself isn’t bad, but it’s not a lot of fun either. 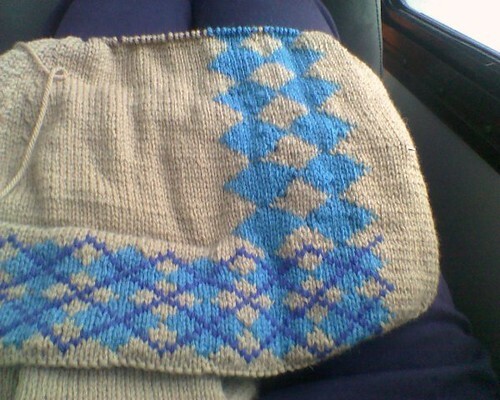 The crazy intarsia at the beginning was at least challenging. Now I’m just on the slogging part. I’ve been making up excuses for why this has been such a slog. It’s dense yarn (Knitpicks Telemark has comments on Ravelry stating exactly that. I picked it because this is a COAT I wanted it to be dense) It’s a dense gauge on US 5’s. There are a lot of stitches. Then I was checking for size 5 circulars the other day and realized I had 2 sets empty. This was a “light dawns over marble head” moment – the coat is on fricken’ size THREE needles. No wonder it’s so dense I can only knit a few rows before my hands get tired. All that aside, I still love the jacket. I love my tan and blue color combination. And it’s jacket season here, I want to be loving my finished jacket. So I’ve been knitting just a few rows each night before moving on to other projects. I’m a mere 3.5 inches from finished with the body, and I’m really hoping the knitting will get easier after the armhole divide. At least I won’t be working 257 stitches to the row anymore! I insisted on slipping the first stitch of each row (my own modification, I should have followed directions better!). 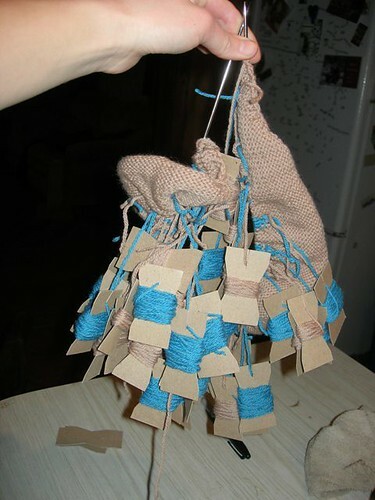 This means those increasing edges are impossibly tight, and have started causing the fabric to pucker. At the time I thought it’d block out, but I’m no longer convinced. In fact, I’m considering (after testing on a swatch first) trying to sew up the bases of all those increase stitches and actually cutting the slipped stitches in a few places to release the tension. Has anyone ever tried such a thing? Or heard of someone else trying such a thing? I’m thinking it’d be a little bit like steeking – since I’m talking about cutting the stitches along the side of the fabric, that’s kinda like the vertical lines involved in steeking… Right? It’s fall, in fact, in my yard it’s already late fall. The leaves are off the trees, it’s not yet dawn when I leave the house, and scraping frost off my windshield happens every morning. For me, my baseline amount of knitting time is probably 8 hours a week (4 days on the bus, minimum) which means I get plenty of knitting done in all seasons. 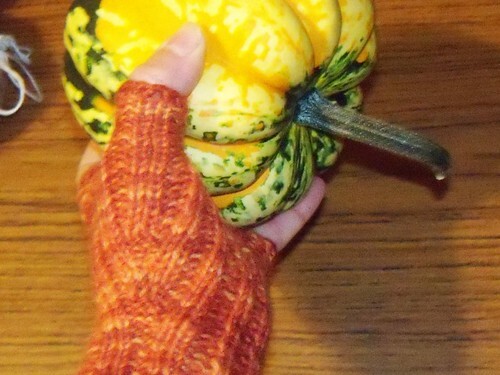 But in fall I find myself knitting All The Time. It’s the knitting season, and this year it seems to be sweater season. I am, in fact, working on FOUR sweaters right now. 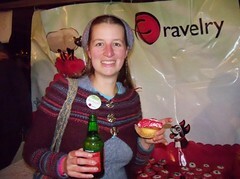 Two from Twist Collective (Argyle Jacket and Orange Pop), my handspun Elisa, and a men’s sweater of my own design. I’ve been switching happily from one to the other any time I feel like it, and thus making pretty good progress on all of them. 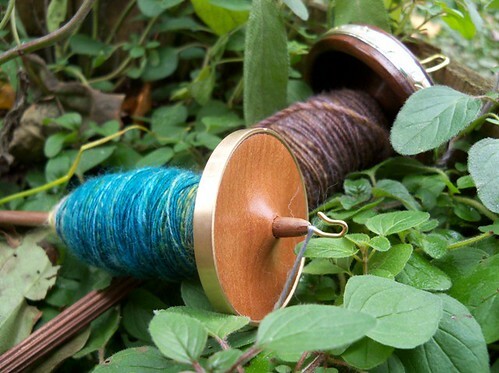 On Sunday I did some spinning on my new drop spindles as well. I’m spinning up each little bump of my Into the Whirled sampler and then chain plying them in order to maintain the colors. I think I’ll knit something fabulously stripy once they’re all spun up. 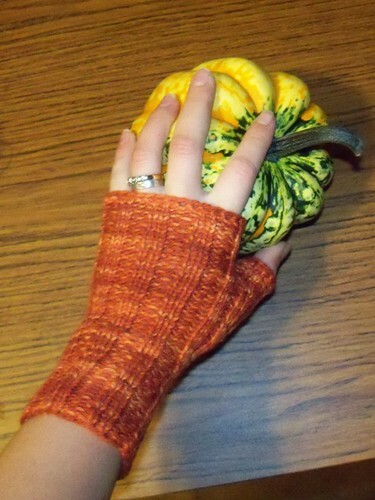 Do you find extra time to knit in the fall? What else says “It’s Fall!” where you are? 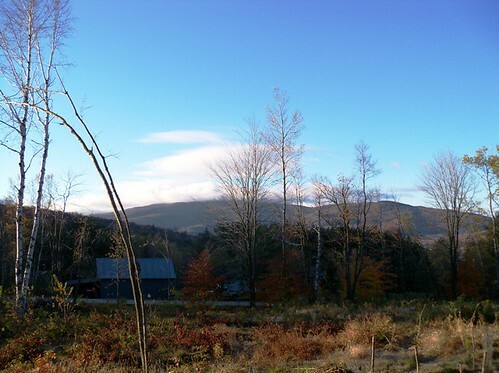 It’s been a colder then average fall here in VT, and that’s saying a lot! 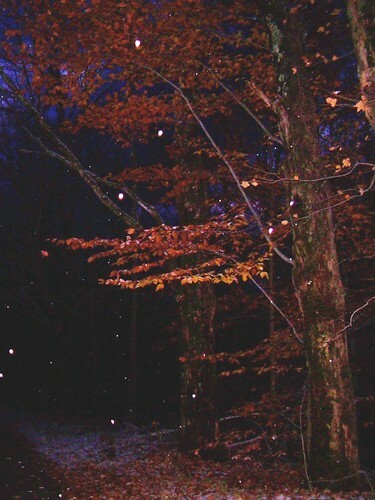 While I was camping at Rhinebeck Neil was at home watching the dogs enjoy their first 3 inches of snow for the year. All this cold and rain may be part of what’s causing my crazy sweater knitting madness right now. But it’s also the reason for fires in the woodstove and comfort food for dinner. We’ve made a lot of soup: veggie soup with the squash so soft it falls apart and thickens the broth, chicken soup with rice and barley, and my favorite – Neil’s amazing beef stew that stews for hours in the dutch oven. We’ve made a lot of what I like to call “one dish” meals too, which would probably be generalized to “casseroles” in most homes, except I don’t like that word. To me a casserole is a soggy noodle dish, probably flavored with a can of condensed soup. The other night I made a broccoli, potato, and hamburg dish with cheese sauce. Sure sounds like a casserole right? But the broccoli was cooked just enough and still had the texture of fresh cooked broccoli. The potatoes weren’t crumbly, and the cheese sauce was made from a flour roux with cabot hunter cheddar and fresh parmesan. What can I say? I like good food. Last night was Neil’s turn to cook. Over the phone I told him I didn’t care what we had for dinner as long as I didn’t need to think about it. Oh, but we should probably use up the leftover ham in the fridge. After I got off the phone I realized that ham would be amazing cut into little chunks and mixed into home made baked mac & cheese (another of Neil’s specialties) I almost called him back, but decided he’d probably already started something else. Luckily for me, Neil was reading my mind. He must’ve been because when I got home that’s exactly what he made for dinner. It was just as tasty as I’d imagined too. Tonight we both get home late, so it may be time for one of my favorite, quick one-dish meals. Chop bacon fine and fry it up while boiling potatoes. Once they potatoes are almost cooked add them to the bacon pan (yes, with all the grease) once they’re just about finished cooking add some green beans. Again, I like the veggies in these dishes to still have their own personality and texture, they should just take on a hint of the flavor of the rest of the meal. In this case that flavor is BACON. Yum. 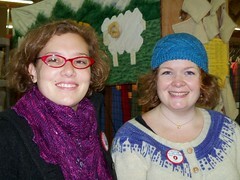 Of course I took knitting with me to Rhinebeck. I had to have something to knit while standing in line or eating lunch. 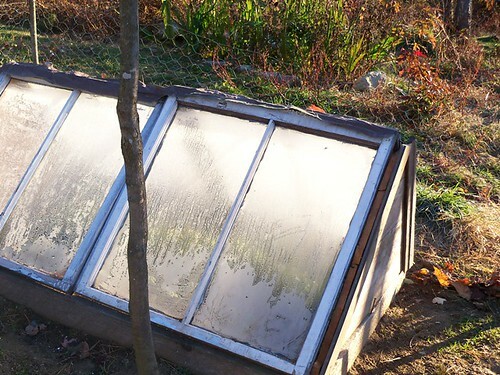 I wanted a project that was small and portable, not one that would involve looking at a pattern a lot or juggling too many tools. 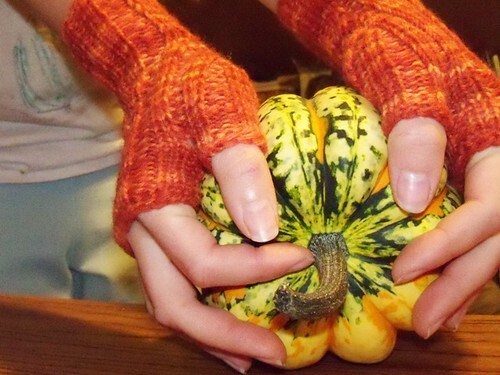 Enter the pumpkin gloves! I cast on for the first during lunch on Saturday and bound off the hand of the second during the car ride home on Sunday. I added the thumbs and wove in ends Sunday night. They’re simple, 2×2 ribbing the whole way around, and since I made them up as I went along, there was no pattern to fumble with. 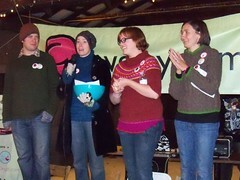 The yarn was leftover from my pumpkin vine sweater, which I wore on sunday. So there was a little confusion from passing knitters as to how I was knitting and wearing something all at the same time. But that was easily cleared up. They’re both Goldings and I love them. I had thought I’d get something carved, but the carved whorls I like best were all flower shaped, and I already have a drop spindle with a carved, flower shaped, whorl. The large one is 1.2oz walnut with just the inlaid ring that you can see in the photo. The small one is a 0.5oz cherry with a brass ring. These ring-weighted spindles really do spin even longer then my other two. I’m very excited to start spinning on them. 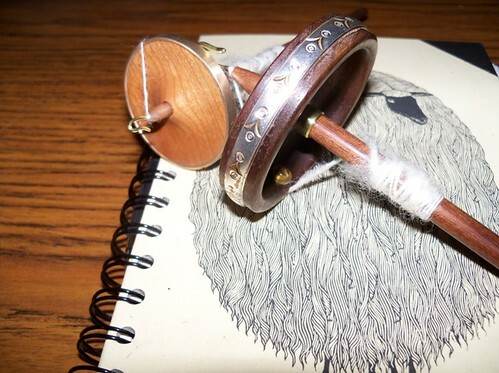 I think that having more spindles around might help me keep more then one spinning project going at a time. I find that sometimes I get bored of a spinning project and then don’t spin at all. This happens with knitting and I just switch to a different project. Why not apply the same idea to spinning, right? Right! The first thing I want to try are these little rounds of fiber. 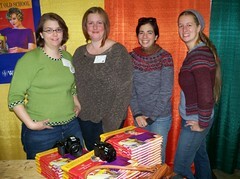 *One sweater gave the inspiration that solved my purple and green sweater conundrum!